Originally referring to the presiding protective deity or spirit of the place, in contemporary usage, ‘genius loci’, refers to a location’s distinctive placeness, that is its past, current and future essence. In place making, the intention of creating place is embedded in evoking a deeper and more intuitive relationship between people and the places they inhabit. So I have been cogitating on “Spirit of (the) Place”, me and several others if truth to be told. It occurred to me as a lapsed scientist to go check the data and see what that says of Sop. Had a few problems finding said data but in the end found a couple of articles one of which was a submission to a learned architectural journal. Once I had managed to decipher the polysyballic morass, which was no doubt intended to clarify and remove the curtains of ignorance, I came to the following conclusion: there is no easy definition of SoP. All the articles agreed that a place could have its own spirit but that like Schroedingers Cat it would be changed or interpreted (or both) by its observer. The one thing they all agreed on was ambiguity. While SoP could exist on its own, say in a wooded glen next a babbling brook exuding peace and tranquillity, that SoP is changed by how it is perceived and by the personality and desires of the observer. If a tree falls in a forest and there is nobody there to hear it does it make a sound? 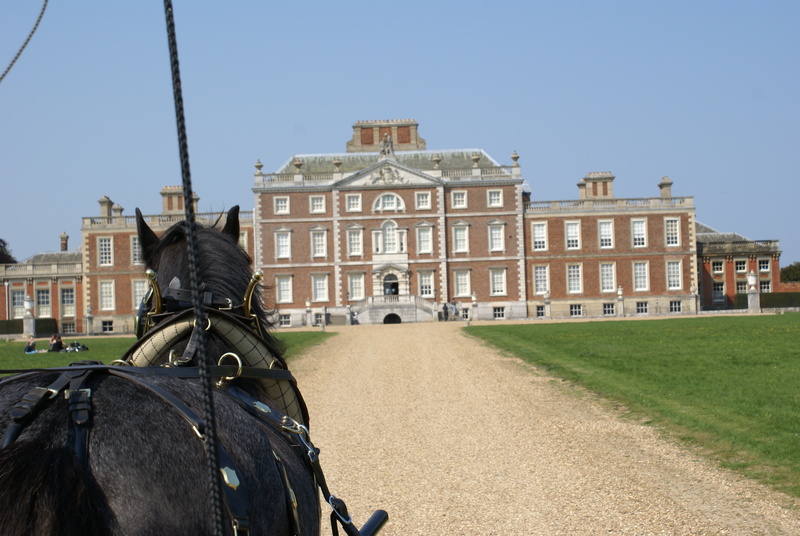 So what to me is the SoP of the Wimpole Estate? This picture to me evokes the Spirit of Place.You decide what it means for you. To me it’s the view of the house and being on a Shire drawn carriage on a sunny day and the way that all coalesces into a tingle up the back and a feeling of secure pleasure. This entry was posted in Conservation, Horses, Mansion by captainsvalet. Bookmark the permalink.